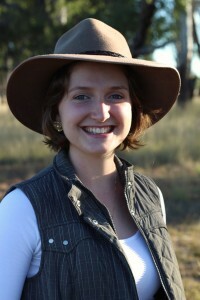 Katie Gersekowski, is a 19-year old girl raised in a small rural town of Australia. 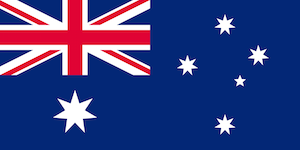 Currently studying a Bachelor of Commerce (Major International Business) at the Australian National University in Canberra, she is committed to pursuing a career that creates positive change around the world. In 2012, at the age of 14 she was diagnosed with severe chronic illnesses. After years of continued health deterioration, Katie and her family made the life changing decision in 2014 to travel to D. Gary Young’s clinic. It was there her life was revived in every aspect, and coincidently, discovered the CHIME IN (The Change Is Me International) Youth Ambassador program. Katie believed whole heartedly this program would be the perfect opportunity to fully embrace her new found health and pursue her life’s purpose. In past years Katie has begun sharing her personal health experience with others to encourage them to live with an attitude focused on graciousness, and to find strength to rise above life’s trials. Not only this, but Katie has been heavily involved in her local Interact Club. This club annually raises funds for international non-profit organizations, working to better communities around the world. In 2015 Katie coordinated ‘Movement for Mozambique,’ an arts evening that raised $3,500 for the African organization Rubatano, which runs educational sewing projects to help girls break out of the poverty cycle. Last year, 2016, Katie assisted in hosting ‘Trivia for Tuition,’ a trivia night which raised $4,000 for another African organization that sponsors the education of children in Zimbabwe. In addition to these commitments, Katie has further contributed to her position as a Youth Ambassador by publishing various articles on the United Nations Sustainable Goals to educate her wider community. Throughout her time as a Youth Ambassador Katie has gained highly valuable skills. She is now a CHIME IN mentor, helping this year’s Youth Ambassadors to attain their goals and reach their highest potential, through offering advice and support. UN Goal is ‘Healthy Lives For All’. 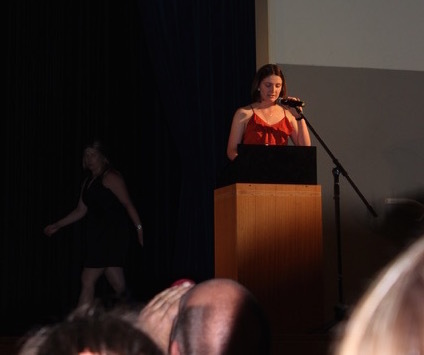 When Katie was in grade 11 (2015) at Chinchilla State High School (CSHS) Australia, Katie was a part of the ‘Interact Club.’ As a club, their purpose is to create two fundraising events each year, one that supports a community cause and an international cause. Within the club, two years ago Katie held the position of International Project Director, overseeing the coordination of the annual international event. She saw this as an opportunity to combine her Youth Ambassador project with this club, to ensure it reached its highest potential! This lead to the creation of – ‘MOVEMENT FOR MOZAMBIQUE’. 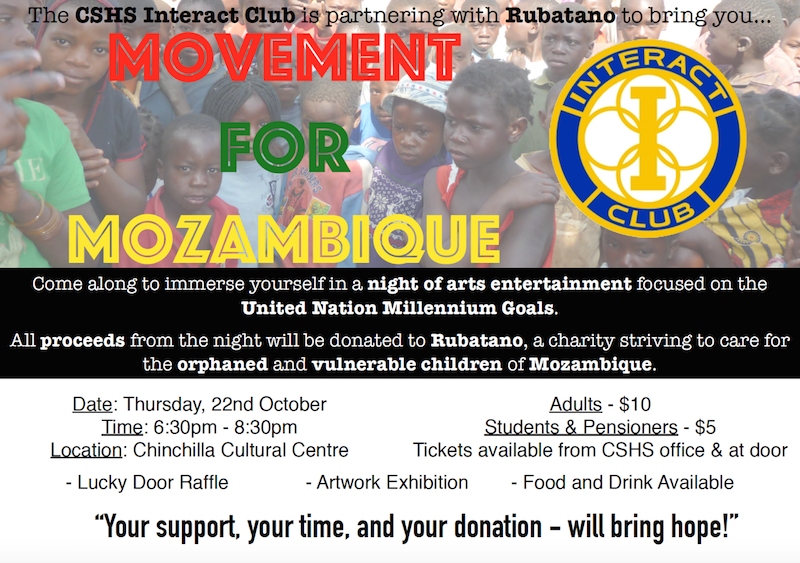 Movement For Mozambique, was a night of arts entertainment focused on the United Nation Millennium Goals (now called Sustainable Goals). Through choosing to spread awareness of these goals through arts entertainment – it is not only educational but it leads to greater health, supporting Katie’s UN Goal ‘Healthy Lives For All.’ Studies have shown that self-expression through music, dance, drama and artwork can decrease stress levels which in turn lowers the rate of heart attacks, etc. The supported charity of the evening was Rubatano. ‘Rubatano’ works in communities of Mozambique. They strive to care for an estimated 1.5 million people living with HIV/AIDS and 740 thousand children orphaned from this epidemic. Within the organization, an educational sewing project has been developed. When orphaned, many young women are forced to abandon their education, and turn to prostitution as financial support for themselves and siblings. To save many young women from turning to this, lessons on basic sewing skills are being put into place to educate them. Young women who finish these lessons will be vocationally equipped and given hope for a brighter future. All proceeds raised from ‘Movement for Mozambique’ will specifically be put towards this project. Katie had the honor of being the Master of Ceremony. It was hosted at the local town centre, which had a capacity of 300. Defying all expectations, the town centre was filled! Going into the night Interact had already raised $1,00 and covered all additional costs due to generous sponsors. Katie shared, “Our goal was to raise $2,500 so we could provide Rubatano with 3 teachers for a period of one year on the sewing project. But to our amazement we not only reached our goal … we smashed it, raising a massive $3,500!” This means Interact was able to provide the 3 teachers, plus five sewing machines. “I am so proud of my fellow Interact members for all of their tirelessly work, and am so thankful to everyone who made a donation to help us achieve this dream,” said Katie.